Vangelis Papoutsis bought the Ainslie Takeaway in 2012 after leaving his idyllic island of Kastellorizo and moving back to Canberra, the home of his wife. On Kastellorizo, Vangelis ran a traditional Greek seafood restaurant, called Alexandra – the name of one of his children. “When I was looking for a business in Canberra I was attracted to Ainslie because of the wonderful community of traders and the wide selection of shops,” Vangelis said. When Vangelis bought the takeaway is was called Theo’s. Which is ironic because this is a Greek name and the previous owner was Malaysian and constantly called ‘Theo’. Vangelis rebranded it as ‘Ainslie Takeaway’, commissioned new signage, repainted, purchased new seating and put in a pizza oven. There seems to be a great sense of pride from Ainslie Traders as many of the shops have undergone renovations or upgrades in the last couple of years. “I was very proud that Ainslie Takeaway was voted Best Takeaway in Canberra in 2013 by 2CC listeners,” Vangelis stated. It is also one of the few places in Canberra where you can get a traditional Australian hamburger and a wide selection of gourmet burgers. The Aussie Burgers are made on the premises from prime beef mince and a few additional herbs and spices, and after time on the grill, are turned into sizzling hamburger patties. They are then placed on a Brumbies bun with lettuce, tomato, beetroot, onion and either tomato or barbeque sauce. Another 10 gourmet burgers are also available including: Cajun Steak Burger, Portuguese chicken Burger and the Mexican Chili Burger. “Other specialties include the Ainslie Burger and the Ainslie Chili Burger – grilled chicken breast, pickled relish, avocado, bacon, lettuce, tomato and onion and aioli sauce. The Chili Burger is the same but with jalapenos and hot chili sauce instead of pickles,” Vangelis outlined. There is also a full takeaway menu including old favourites such as dim sims, home-made potato scallops, spring rolls and a great selection of grilled, crumbed and battered fish – and the best chips around. 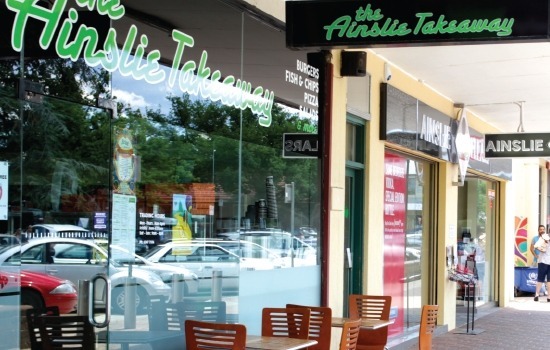 One of the great things about the Ainslie Takeaway is that you can also dine in with a either a Chicken Schnitzel Dinner, Fisherman’s Basket, or a selection of fish dinners and salads including Greek, tabouli and coleslaw, made fresh each day.